Today, the U.S. House of Representatives is scheduled to consider H.R. 6757, the Family Savings Act of 2018, which includes language recognizing the humanity of the unborn child. Currently, Section 529 of the IRS code allows individuals to make tax-advantaged contributions to an account intended to save for a child’s future education expenses. 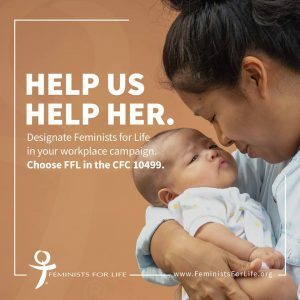 Feminists for Life of America supports the expansion of 529 plans in section 302 of H.R. 6757. “The Family Savings Act of 2018 measure enables families to use these education savings toward apprenticeship fees, the cost of homeschooling, or paying off student debt. As Feminists for Life, we express our appreciation to all who led this effort and all who vote for this bill in the House. We urge the Senate to join in this effort,” said FFL President Serrin Foster. (i) IN GENERAL.—The term ‘unborn child’ means a child in utero. (ii) CHILD IN UTERO.—The term ‘child in utero’ means a member of the species homo sapiens, at any stage of development, who is carried in the womb. This definition is identical to the language in the Unborn Victims of Violence Act (18 USC 1841). Enacted in 2004, this law recognizes that when a criminal attacks a pregnant woman and kills or injures her unborn child, there are two victims of that crime.